A photo shared on Facebook shows the last Chevrolet Cruze going down the line at GM's Lordstown factory. Editor's note: This story originated from Reuters. The previous version of this story misidentified the news source. General Motors said the last Chevrolet Cruze rolled off the assembly line Wednesday afternoon at its Lordstown, Ohio, assembly plant, the first of five plants in North America to end production this year and ending U.S. production of the Cruze. 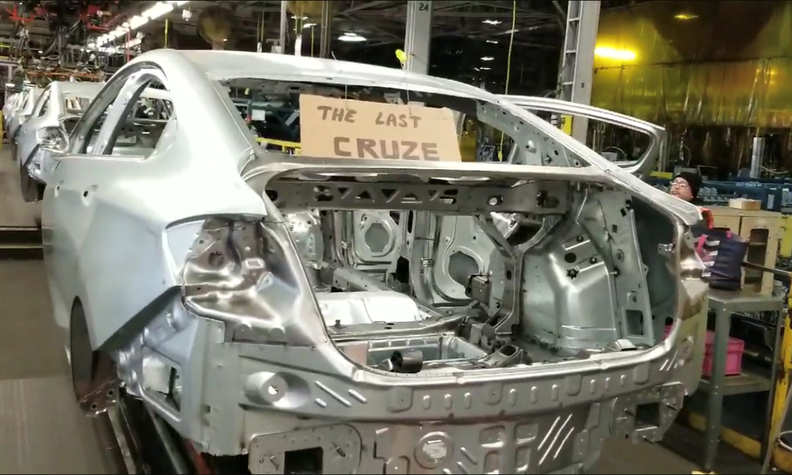 Workers posted photos of the final Cruze making its way down the assembly line on social media. It came off the line around 3 p.m., a GM spokesman said. The Cruze "was a good product and was built with tremendous pride by the Lordstown employees. We know this is an emotional day for our Lordstown team," GM said in a statement. The Lordstown plant is being idled, resulting in the loss of 1,500 jobs. Since 2017, GM cut two of the three production shifts, eliminating 3,000 jobs amid sagging demand for small cars. GM is continuing to produce the Cruze in Mexico for other markets, but not for the United States. GM noted that over 400 Lordstown employees have accepted offers at other GM locations, and it reiterated that jobs are available at other assembly plants for anyone willing to relocate to other states. The UAW, which has filed suit challenging GM's decision to end Cruze production at Lordstown, said it "will leave no stone unturned in keeping the Lordstown plant open." GM CEO Mary Barra has said the final fate of the plant and whether it will reopen will be decided this summer in contract talks with the UAW. The 6.3-million-square-foot Lordstown assembly complex has manufactured more than 16 million vehicles since it opened in 1966, including nearly 2 million Chevrolet Cruze cars since 2010. In November, GM announced it would idle five North American plants, including Lordstown, and cut up to 15,000 jobs. GM also disclosed on Tuesday in a notice to the state of Ohio it would cut 101 jobs at the West Chester, Ohio, service and parts warehouse and operations facility that is closing. The automaker told employees of the plans in June 2018 to close the facility and shift the work to a new warehouse in Burton, Mich. Ohio workers can move to Michigan if they choose, GM said. U.S. Sen. Sherrod Brown, D-Ohio, called Wednesday "a heartbreaking day. ... These workers are the heart and soul of GM." Separately, the UAW and the Communication Workers of America union sent a letter this week to the House of Representatives Ways and Means Committee asking it to investigate significant corporate tax cuts received by GM and AT&T even as they cut thousands of union jobs. The letter said there is "no evidence to date that the corporate tax cuts have encouraged GM to bring back any production from Mexico to the U.S."
GM and AT&T did not immediately comment on the letter.